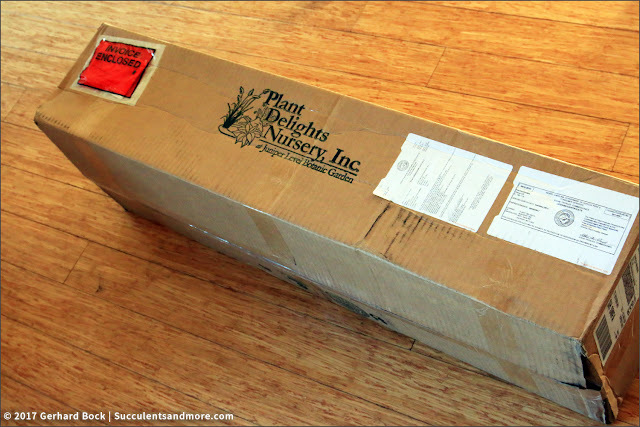 I was a bit surprised by the size of the box, considering I ordered only five plants. However, right after opening the box, it became clear that everything was very well packaged. ×Mangave 'Spotty Dotty' is a vigorous 2017 Walters Gardens introduction...a Hans Hansen hybrid involving three North American natives...Agave gypsophila, Agave bovicornuta and Manfreda maculosa. [It] forms a 10" tall x 3' wide rosette of 3" wide, lightly wavy, glaucous, blue-green leaves, highlighted by an abundance of maroon spots and edged with soft, plastic knife-like serrations. Agave multifilifera 'Starshine' is a stunning century plant, similarly patterned but different from the better known Agave schidigera 'Shiro ito no Ohi'. The leaves of Agave multifilifera 'Starshine' are 1/2" narrower (3/4" compared to 1.25") than Agave 'Shiro ito no Ohi', each surrounded by a very bright cream border. The solitary, non-offsetting Agave 'Starshine' is adorned with an abundance of small white curled hairs. The comment about it being solitary is interesting, considering my plant does have a pup already! Agave 'Bluebell Giants' is a 2016 Plant Delights Nursery introduction of a seed strain of century plants that originated from our 2014 cross of two of our largest and hardiest century plants, Agave × protamericana and Agave × pseudoferox 'Bellville'. If the size of the parents is any indication, we expect the offspring to reach at least 7' tall x 12' in width or larger. 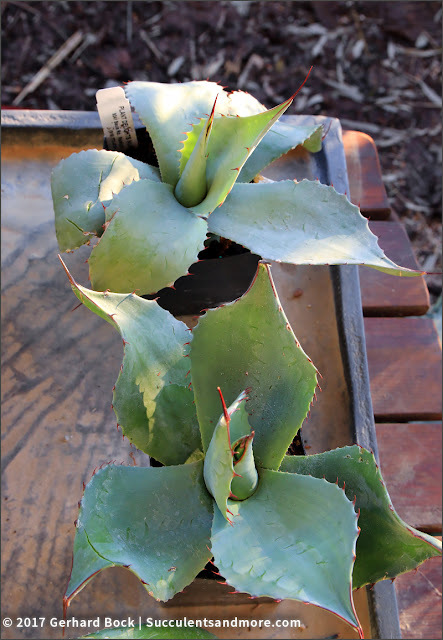 Each Agave 'Bluebell Giants' seedling is different, but the consistent traits we've seen so far are fast growth rate, nice blue foliage, and upturned leaf tips. Agave 'Bluebell Giants' contains genes from at least three agave species (Agave americana, A. asperrima, and A. gentryi). This is a limited-time offer or until we run out of seed. The mature size of this cultivar is intimidating, but I couldn't resist. Now to find a spot for it! We grew this seed batch of Agave ovatifolia and it was quickly obvious there had been some romantic hanky panky in the high desert mountains of Northern Mexico. 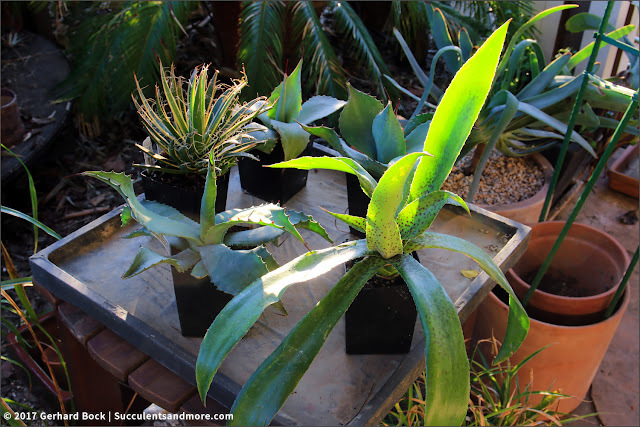 The resulting offspring from the tryst appear to be hybrids of Agave ovatifolia with the lovely Agave parrasana and possibly Agave asperrima (scabra). The foliage of Agave 'Desert Love' ranges from wide to narrow with an assortment of recurved leaf tips, spine patterns, but almost consistently blue foliage...unlike the mostly green Agave ovatifolia hybrids we offer as 'Huasteca Giant'. This is our first offering of these amazing plants, so if you like hardy century plants, you may want to try several, since each individual is different. We anticipate most plants will mature in the 2' tall x 6' wide range, but there will be some smaller and some larger. This one sounded so interesting that I ordered two. I'm really excited about the potential of these rare and unusual cultivars. It's always good to have replacements on hand in case an in-ground plant needs to be removed. The likelihood of that happening is high after our extremely wet winter. Oh, the excitement of the arrival of a plant-filled package! You got some beauties, Gerhard! Plant Delights Catalog is, indeed, entertaining and chock full of treasures and humor. I wish I'd saved all my Plant Delights catalogs from previous years. Wow...that's a lovely purchase. 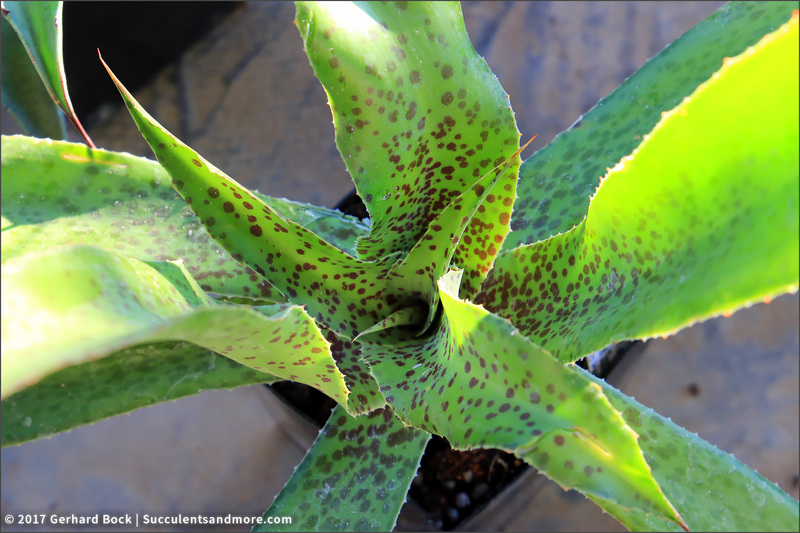 I am amazed the ×Mangave 'Spotty Dotty' arrived looking so good, their leaves are so easy to break! Their packaging skills are impressive indeed! You know me. Buy first, ask questions later! Great selections! I haven't ever ordered from Plant Delights, although I have checked out their catalog on occasion. Now that you've pointed me in the direction of the agaves, I may have to correct my omission. I can highly recommend them. Very healthy plants, and surprisingly large. Wow, what a testimonial to Plant Delights that 'Spotty Dotty' wasn't broken up all to hell ! So far my purchases via mail order this year have been limited to Lily bulbs. I'm about due for an Annies run ! I was eyeing those Mangave hybrids myself. Where are you going to put a 12' wide Agave? I honestly have no idea where these massive agaves will go. Probably into containers for the time being. And eventually a spot will open up somewhere. Or maybe I'll plant them in a large open-bottom metal container partially sunk into the ground; that might naturally stunt their growth. Nice selection. 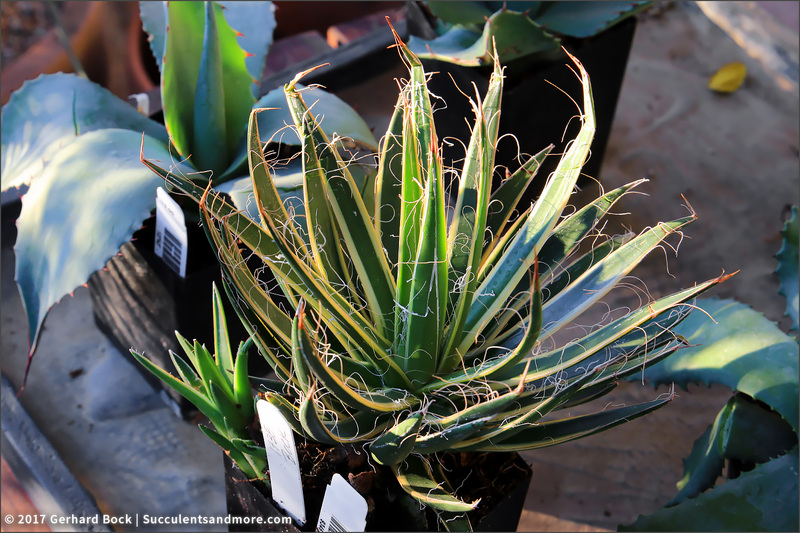 I periodically go through their catalogue and fill my cart with whatever agaves strike my fancy, then abandon my virtual shopping cart -- cheap therapy! I liked their selections this year too. 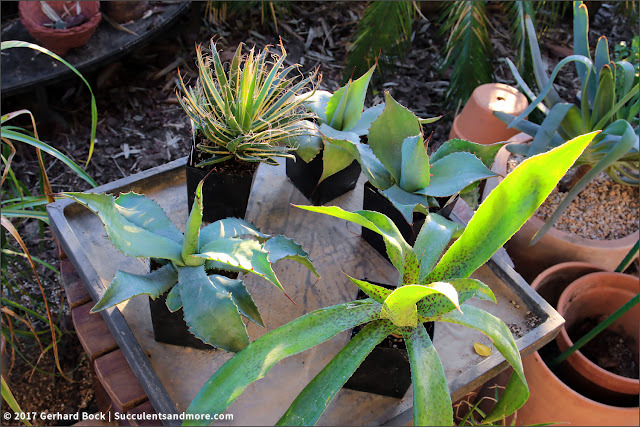 I do the cart-as-a-wishlist thing all the time, not just with Plant Delights. It helps cheer me up when I'm in a funk. So glad to hear I'm not alone in low-impact online plant shopping! Gerhard, thanks so much for including us all in the fun of opening your box of PD treasures. Not only is that 'Spotty Dotty' unbroken, but it looks to be remarkably far along the way to its mature size. 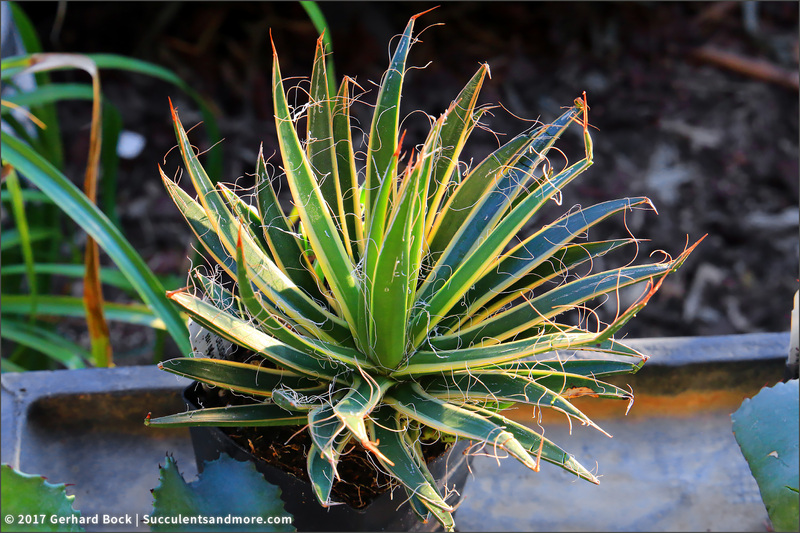 Unlike that someday-whopper agave, which... well, tomorrow is another day, eh? I think 'Spotty Dotty' will be a fast grower. 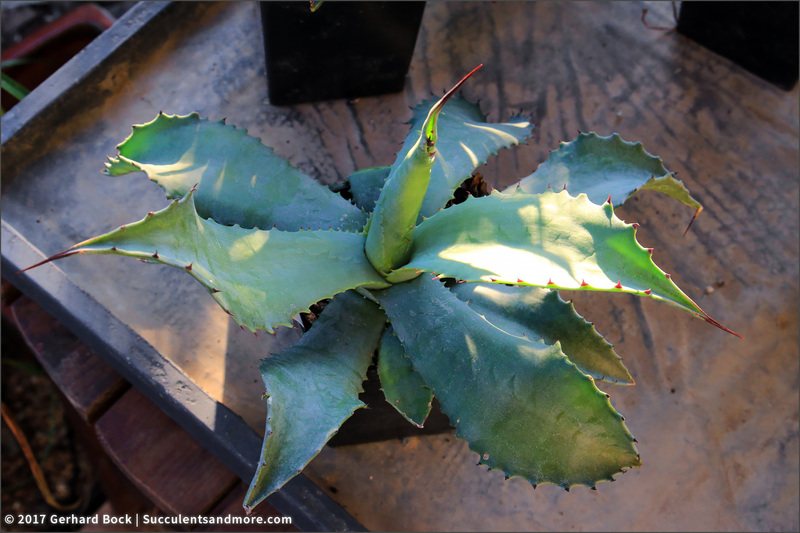 Unlike the monster agave, which will take years to mature (thank goodness for that :-)). Gerhard - Thanks for your nice comments about PDN. I am a Plant Delights employee who came across your review of our plants and our packaging. We almost always have to use the large boxes for agaves and mangaves because their large, rigid, and easily breakable leaves do not fit well into our standard sleeves / boxes. 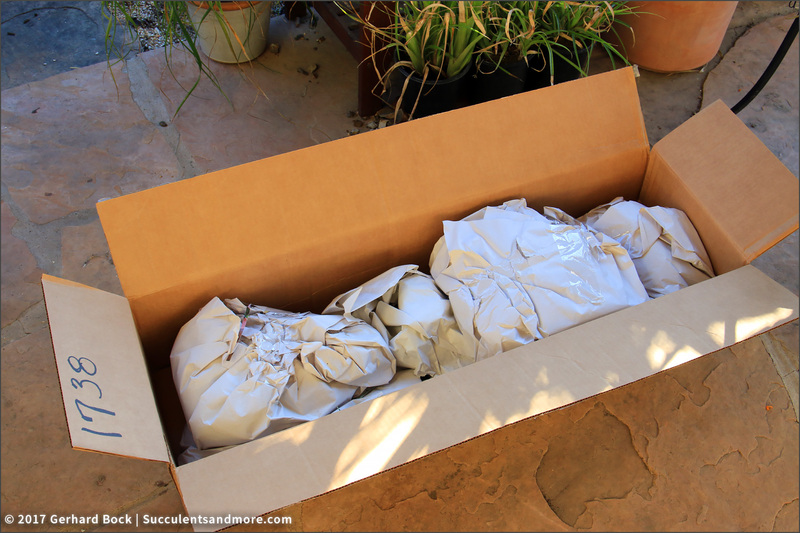 Thus we have to hand wrap each agave like a christmas present to keep them intact during shipping. We hope you enjoy your plants. - Dennis Carey (The PDN IT guy). Dennis, thank you for posting! Your coworkers did an outstanding job packaging my plants. 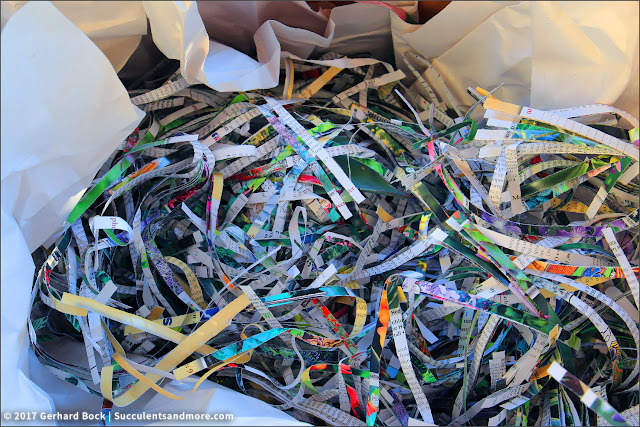 Your comparison to Christmas presents is perfect--that's what it felt like :-). Thank you for offering such great plants--and such great service!